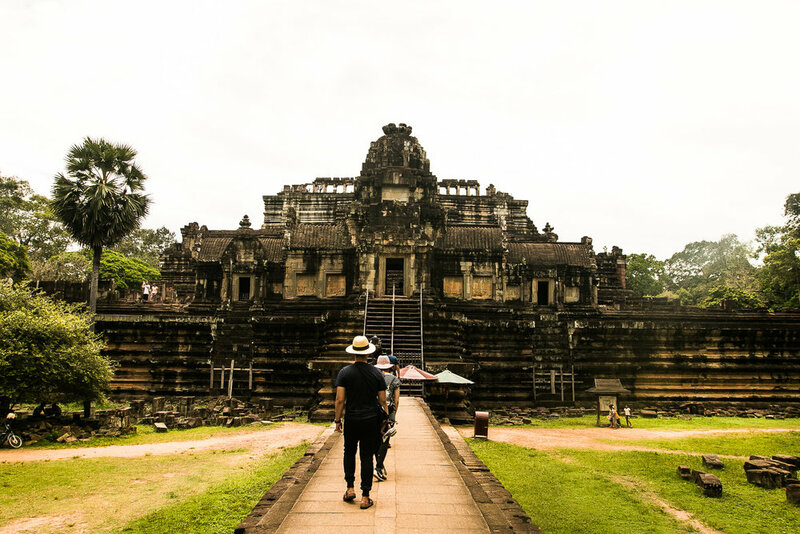 Constructed in the 11th Century under the rule of Udayadityavarman II* to serve as a state temple in dedication to the Hindu god Shiva, Baphuon Temple stands as a three-tiered temple approximately 50 metres tall (when you include its tower). According to historical record, in the late 13th Century, the temple was so impressive that the emissary to Temür Khan* wrote about it in his journals as being, "a Tower of Bronze," that was, "a truly astonishing spectacle." In the 15th Century, however, the temple was converted to a Buddhist temple due to warring factions; from which, it then adorned a 9x70 meter reclining Buddha on its west side terrace. As an interesting side note, one may begin to wonder why there are so many temples dedicated to the Hindu god Shiva (lord of destruction) across the Siem Reap province of Cambodia. Reading more into Hindu mythology, one will note Hinduism's 'holy trinity' of Brahma, Shiva, and Vishnu, each representing one of the three primary states to all of nature — creation, destruction, and sustenance. Coincidence? Or is there something to these ancient Cambodians' reverence for death and a pragmatic understanding that "we've all only got one life"? Regardless, the structure stands as a truly amazing piece of history, and something to behold.